No plans to feed supplement to any herds this week. However, grazing residuals and pre-graze pasture cover for each paddock will be monitored by the farm team each day to determine whether supplements are required in individual paddocks. 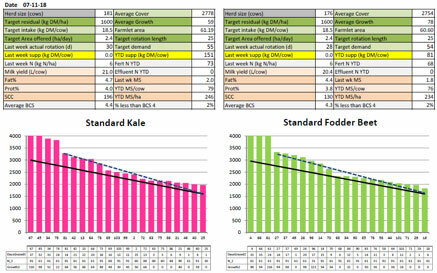 x1 more std Kale and FB paddocks for each farm have been identified for surplus. With only 16-20 pasture paddocks currently available for grazing in each farm due to surplus shut up (aside from LI Kale farmlet which has no paddocks out) and new grass paddocks out of the rotation, the pasture allocation will remain on a 1 ½ days/paddock grazing plan (x3 grazings/pdk). Ideally surplus paddocks identified last week would have been harvested, however due to weather conditions paddocks are now on the waiting list for the contractor. From the feed wedge, shut up paddocks are above 3500 kg DM/ha, however the pasture appears to be holding quality with minimal seed head or lodging. Bales made will be labelled based on their farm and date ensiled; The visual appearance of the pasture that is harvested will be noted to help with future decisions as to whether it is more suitable for milking cow supplement or wintering feed on crops. All batches of supplement made will have a nutritive value test completed. The different N fertiliser regimes are starting to impact on pasture growth rates and there are visual differences in the pastures. Pastures in the low impact systems have more pronounced urine patches and are less dense between the urine patches. Stems are elongating and leaf emergence is slower. The decision has been made this week to complete this round of 30 kg N/ha on the Std farmlets to ensure all paddocks have received approx. 90 kg N/ha season to date. Paddocks already at 90 kg N/ha will not receive N at this stage. 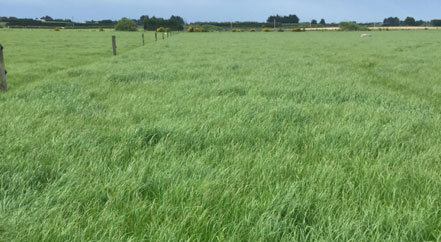 Once the silage has been harvested the requirement for N will be reassessed based on pasture growth rates. We require at least 50 units of our 200 kg N/ha limit for late summer early autumn application to extend the rotation and achieve dry off APC targets so need to be strategic with N use over the next 4 months. From next week there will be milk production reported from x2 vats; SN 31445 for the Kale farmlets and SN 31443 for the FB farmlets (as seen in table 2). This will allow the FB and Kale farm systems milk to be kept separate, allowing vat milk samples to be collected for more detailed milk composition analysis looking at the effect of supplement type on milk processing characteristics. 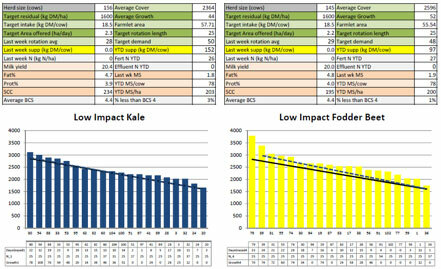 The grass to kale paddocks will be sprayed out this week with target sowing mid-November. This week the synchrony programme was completed on the R2s and they head away to the grazier. Out of x146 animals, x8 did not cycle following the PG programme. After the 5 days of AI mating Hereford bulls were then joined to the mob. The cows were BCS scored this week, averaging BCS 4.4 across all farmlets. We have almost completed the screening of the herd to identify staph aureus cows. Currently 5 % of the herd have been identified as having staph. Despite this the BMCC is sitting between 100 and 140 000 and we are not getting many cases of clinical mastitis. We are currently looking at options to safely re-integrate these cows into their farmlet herds to eliminate the need for a large peno mob. Mating commenced on the milking cows on 8th November with 26 cows submitted across the 4 herds. Between 3 and 5% of each herd were identified as non-cyclers at the PSM, however 90% of these were late calving cows. Faecal samples were taken from cows that had dirty tails and overall scruffy appearance; the results have come back clear, and there is no longer any suspicion of an underlying internal parasite issue. The calf suspected with BVD has come back clear. Effluent samples to be taken on a monthly basis so we can calculate the N loading on effluent paddocks. Effluent applications are being tracked to ensure the farms are receiving equal applications based on their stocking rates. AgResearch has plans to install a new type of lysimeter under one of the 2019 crop paddocks. This will be installed next week and its performance monitored next winter. Prior to mating blood samples were collected from the R2’s and also a selection of mixed age cows. These are the last in our study looking at the impact of different winter crop type on blood mineral content. It will be interesting to see how the fodder beet cow P levels have responded since going back onto pasture.